Wild West themes go a long way in online slots. In fact, any slice of Americana – whether it’s the unusual yet entertaining Alaskan Fishing or the gun-touting Gunslinger – is a big hit with video slots fans. American-themed slots evoke memories of Las Vegas, holidays abroad, or time spent/wasted in land-based casinos. Part of slot developer RTG’s ‘Real Series’ of progressive jackpot online slots, Coyote Cash heads out west with those other great slots in search of similar thrills. On the reels in this 5 reel, 25 payline slot are a stern-looking American Eagle traffic cop, a security van, a rattlesnake, cactus and buffalo skeleton, plus bags of loot and standard 9-through-Ace symbols. The only symbol missing is the Wiley Coyote symbol and his bag of tricks! The sharp-shooting bank robber coyote acts as the game’s Wild, and substitutes for all symbols other than the Scatters. 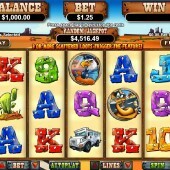 Five Coyote Wilds pays a 10,000-coin jackpot. Look out for the moneybags Scatter on the reels; three or more of those on the reels anywhere triggers a free spins bonus round where 20 spins will be awarded. A multiplier of 2x, 3x or 4x will be applied for 3, 4, or 5 Moneybag symbols respectively and the spins can be re-triggered. If you’re a fan of free spins, this will obviously appeal to you, but there’s more to be had with RTG’s Real Series Progressive Jackpot. The progressive can be won at the end of any game. The jackpot is triggered randomly and is added to all other wins. 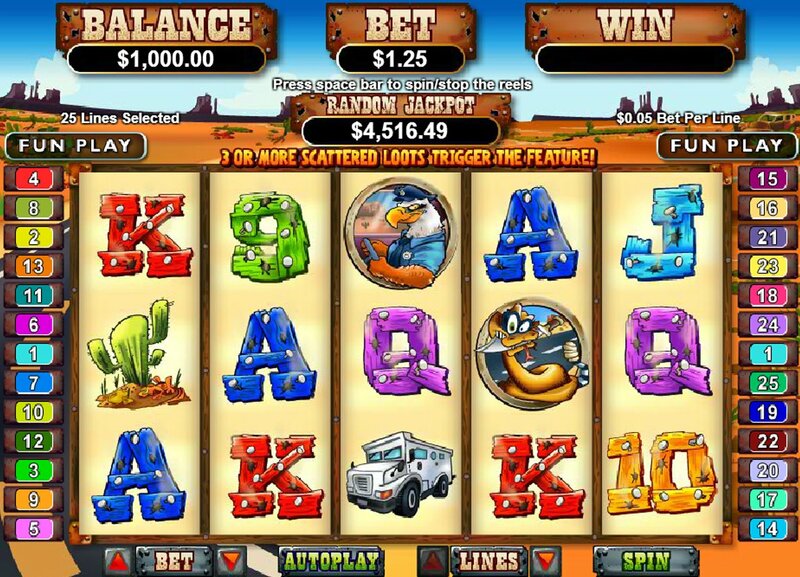 As with RTG’s other Real Series games, Coyote Cash will hardly win any awards for looks (in fact, the graphics are pretty poor overall), but the gameplay is smooth enough, and the free spins generous if you manage to hit the top whack of 30 spins. If you’re after more Wild West thrills, however, check out some slicker slots fare courtesy of Betsoft Gaming with their prospecting-themed Black Gold or NetEnt’s treasure-hunting slot, Boom Brothers.